→Plantar Fasciitis Surgery – Is It Right For You? Most doctors agree that plantar fasciitis can often be treated with less invasive treatments. Some even guess that over 90% of plantar fasciitis symptoms and complications are resolved within a year. Most patients will experience a complete recovery and freedom from debilitating plantar fasciitis heel pain. Simple and often very affordable treatments can start to take effect within a few days to weeks. It’s important to stress, that for the average person plantar fasciitis pain can be treated without resorting to surgery. If you have already tried a variety of proven plantar fasciitis treatment options such as plantar fasciitis night braces, stretches, proper footwear, orthotics or insoles, plantar fasciitis shoes and resolved problems with your posture and weight distribution you might be thinking that you need surgery. Once again, it is rare that surgery is the best answer to heel pain and plantar fasciitis symptoms. Your doctor may switch to a slightly more direct plantar fasciitis treatment such as cortisone injections. So, you still want plantar fasciitis surgery? Ok, let’s examine some of the risks to help make an informed decision about plantar fasciitis surgery. Not predictable – Like many surgeries, surgery for plantar fasciitis is not completely predictable, different people experience varying degrees of success. Some sources state that plantar fasciitis surgery is successful in around 70% of patients. Loss of arch – The most common type of surgery loosens the tension on the plantar fascia, which if overdone, can lead to flat foot issues. You can potentially lose the arch of the foot. Complications arising from this can be worse than the original plantar fasciitis. Nerve damage – Pain and numbness can arise through nerve damage from plantar fasciitis surgery. Misdiagnosis – Since plantar fasciitis symptoms can often appear from other causes, if you were wrongly diagnosed in the first place, the plantar fasciitis surgery will not resolve the issue. Infection – Infection is A common danger with any surgery. Endoscopic plantar fascia release is a newer technology that requires much smaller incisions and uses a tiny camera. The effectiveness and dangers of this technique are debatable. Some doctors claim that this can lead to much wider spread nerve damage. Whether or not this is offered as an option depends on your orthopedic surgeon’s opinion on the matter. 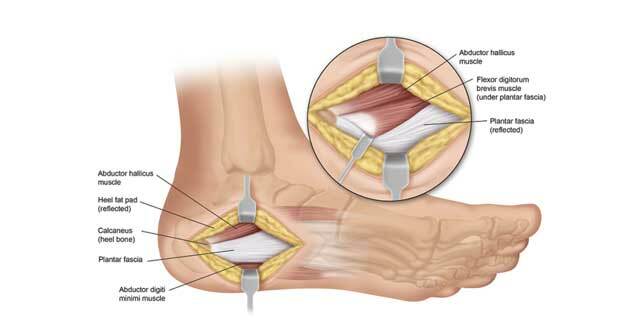 I think the majority of doctors prefer traditional surgical method for plantar fasciitis surgery. Before even considering plantar fasciitis surgery make sure that you have fully exhausted all other treatment options. If you have tried a high-quality plantar fasciitis night splint, exercises and stretches, insoles and orthotics, plantar fasciitis shoes, acupuncture, massage, and postural modification for a year and still have heel pain, then you may want to consult your doctor regarding plantar fasciitis surgery. Make sure you ask many questions and fully understand the risks and the potential for no improvement or more damage. Plantar fasciitis surgery recovery time can vary depending on the age and general health and fitness level of the patient. Before you commit to plantar fasciitis surgery, make sure you fully understand all the implications, dangers, success rates, and most importantly the plantar fasciitis surgery recovery time. Once again, I feel it is important to stress that plantar fasciitis surgery is not usually the best treatment option for the majority of people suffering from heel pain. It is important that you first try a variety of plantar fasciitis treatment options and give them the time they need to be successful before even considering plantar fasciitis surgery. Keep in mind, that a treatment or procedure that works for some, may not necessarily work for you. I also believe that the most important plantar fasciitis treatment is to isolate the causes, and address these first before seeking out expensive and invasive procedures. Buying a new pair of plantar fasciitis shoes or changing your posture and walking stride is a much better treatment than going under the surgeons knife. Plantar fasciitis surgery recovery time can be anywhere from a few months to over a year. Their are no guarantees and each patient responds differently to surgery. Your particular plantar fasciitis surgery recovery time is dependent largely on your age. You adults and children naturally heal much quicker. For most people, the plantar fasciitis surgery recovery time is close to one year for a full 100% recovery. We often take our feet for granted until something like plantar fasciitis pops up and we realize how important our feet really are.One more consideration regarding your decision about plantar fasciitis surgery is whether or not the proper preliminary steps and therapies were first applied. If you decide to see a specialist such as a podiatrist and he or she recommends surgery right off the bat, then it’s time to find another doctor. A good ethical podiatrist will often first try other plantar fasciitis treatments such as custom orthotics, maybe taping along with some type of anti-inflammatory medication. If these are not successful then cortisone injections may be given as the next step in the process. The proper time should be given for each of these plantar fasciitis treatments to work their magic. All these treatments together can easily take six to twelve months to be fully successful. The plantar fasciitis recovery process involves a series of steps and patience will be needed. There will be period of time where you will not be allowed to even get the foot wet. You will have a cast, likely whats called an ‘air cast’ on your foot for about two months. The first week of plantar fasciitis surgery recovery will confine you to your bed except for bathroom breaks. The most important factor in reducing your post plantar fasciitis surgery recovery time will be how disciplined you are about staying off your feet. None of us like to listen to our doctors, this is one time when you should really take his/her advice to heart.